The Official Podcast of MLSReserves.com. 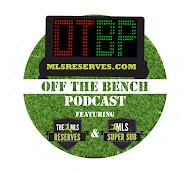 Luke Lohr and Pedro Gomes talk the recent US Open Cup action, including the Seattle Sounders and Eddie Johnson. The New York Cosmos have joined the North American Soccer League (NASL) and recent trade movements caused a stir in MLS. Additionally KickTV guest Jimmy Conrad drops steps in and offers his insight into KickTV and what his goals with the organization are. Conrad also goes in depth about his trip to the Euros and offers reactions to Eric Wynalda's coaching in Atlanta. Conrad also proves he is darn good looking on the radio.